It’s common to buy products or services online. However, before someone decides to spend money online, they study the vendor. The buyers always want to be certain they invest their money well. They look for happy owners of the particular product. This makes testimonials important parts of commercial websites. Testimonials help to build trust in your potential, but hesitant customers. With this in mind, testimonials are best written by your actual customers. Otherwise, you might lose the trust of future consumers, and your income as well. How to get more testimonials? Ask your buyers, after they bought the product or services, to tell their experiences. Let them use their own words, as that makes the testimonial slider unique and more reliable. In other words, avoid asking your customers to rate you on a scale of one to ten. Rather, ask them to write a comment with their own words. Lead them with helpful questions! For example, ask them which feature they liked the most and why. Four or five questions like this can get you a nice testimony from the buyers. Keep in mind that a simple ten-star rating won’t ever be as powerful as someone stating “I love this product!”. Why should you use a slider to display your testimonials? When you sell something online, you want to convert visitors to customers as fast as possible. There are several ways to do this. For instance, it’s a popular way to put testimonials on the home page. Usually, they put them right before the buy now button, which can raise a problem. The testimonials can take up lots of vertical space as people love talking about things they like. So, your potential buyer has to spend their valuable time scrolling through a long list of text. But they wouldn’t have to do that. See, here’s the part where it matters what questions you asked from your buyers. If you asked the right questions, the first couple of testimonies have convinced the visitor. They’re trying to buy now – but they need to scroll a lot first. 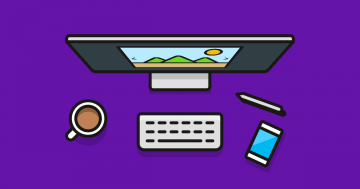 So, why should you use a testimonial slider instead? Well, a testimonial slider saves you lots of vertical space. A testimonial slider shows the testimonial text submitted by your customers. The testimonies are presented in a beautiful, modern and mobile friendly way. The most important task of your website is to make sure your product or service and stand out from the crowd. An effective testimonial widget will prove your product or service trustworthy. The goal is to help to build trust between you and your customers and testimonial sliders help a lot with this. You can create any layout you want. 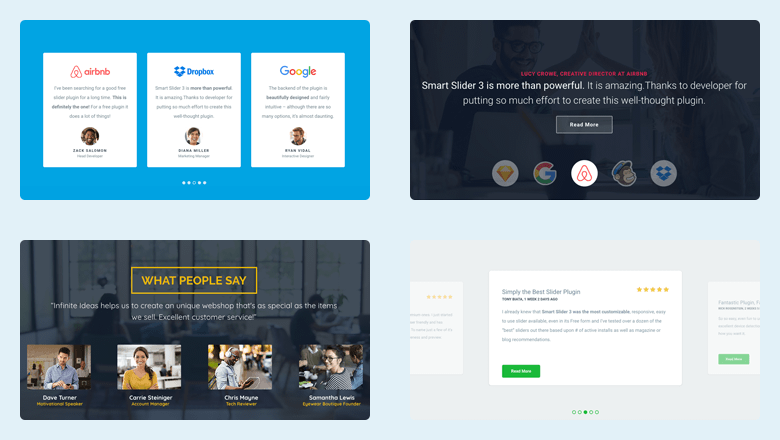 Smart Slider 3 will help you create amazing WordPress testimonial sliders which convert. Once you create your beautiful testimonial slider, it’s easy to add it to your site via shortcode. When people display testimonials on their website, they rarely show only one testimony. As a matter of fact, the more testimonies you show, the better chances you have to convert the visitor. So there’s a big chance you’ll have more than 10 testimonials on your site. Why would that be a problem? When you need to update your testimonials for any reason, it’ll be time-consuming. Say, you decide you need to change the layout – you’d have to do that for every single testimonial slide. Smart Slider 3 comes to the rescue with its amazing feature: the dynamic slide generator. 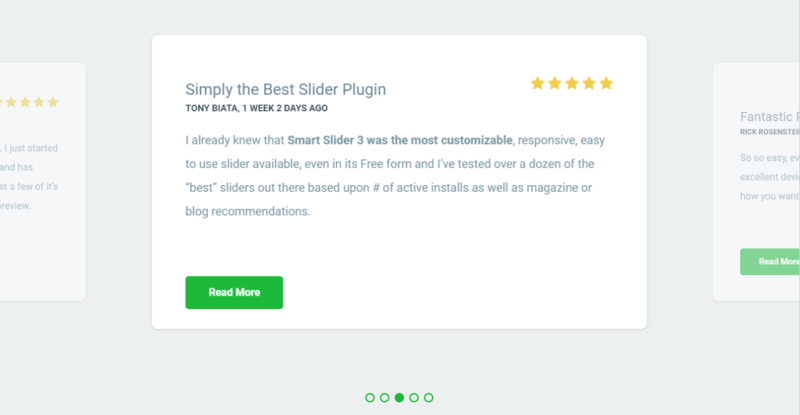 This feature makes Smart Slider 3 the best WordPress testimonial plugin available. 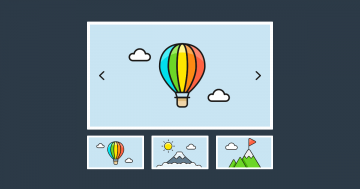 The dynamic slide generator is one of the most amazing features of Smart Slider 3. It’s capable of dynamically fetching content from your WordPress site. This includes posts, pages or custom post types as well. For example, you can create a new custom post type to store your testimonials. This way you can add testimonials by creating a new post. How’s that going to help to make changes in your testimonial slider fast and easily? I’m glad you asked. When you work with a dynamic slide generator, you actually work on one single slide. All other slides are going to copy this layout. If you need to add a new layer, change a color or font family, you’ll need to do it only once. Dynamic slides make the testimonial slider creation process easy and convenient. If you do not need to make any layout changes to your slides, you don’t need to touch them. When you add a new post, the dynamic slide generator pulls it to your testimonial widget. This makes it easy to add or remove new testimonials and change the layout. Now you’ve learned why you should use a testimonial slider on your website. It’s time to see some inspiring examples, to create a beautiful testimonial slider. 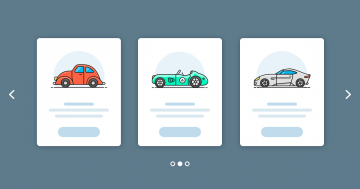 The samples below were created in Smart Slider 3, and you can import them to your website if you like them. Mobile friendly simple testimonial slider. The Simple Testimonial slider, as the name suggests, is a plain testimonial slider. It’s elegant and modern and it’s a great choice to show your testimonies. There’s a static background image behind each slide. The slide navigation is straightforward: there are arrows and bullets. The slider is mobile friendly, which means you can switch slides by swiping. Clean and beautiful slider which shows four testimonials. The Static testimonial slider is a great choice when you have a few testimonies to show. We’ve built it to display four testimonial texts, so it works best if you have the same number of testimonies. In the background you can see a nice video playing while you read the text. You can change the video to something more relevant to your product or service. The Testimonial Carousel is the best way to show many testimonials in your WordPress carousel. Every testimony needs little space, and you can see three slides at a time. The structure is clear which makes this type of testimonial slider very effective. Want to have a testimonial slider to show what the companies you’ve worked with say about you? Look no further! The Testimonial Thumbnail slider example is the perfect choice for this. Your future customer can navigate by clicking on the logos at the bottom. These logos are visible all the time on the slider, they’re easy to spot when the visitors scan your site. The slider is attractive so the visitor will check it out, even if they had no particular interest in your testimonials yet. Is there any better way to show how awesome your product or service is than showing which companies love it? 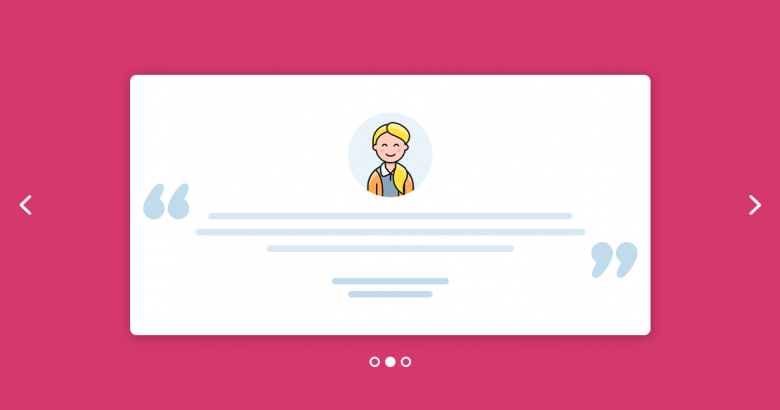 You don’t have avatars from your customers which you could show in your testimonial slider? No problem! The Testimonial Showcase slider demonstrates how important a good testimonial text is. If you have good text, you don’t need avatars to have a testimonial slider that converts. If you want to strengthen your message, drop a 5-star image to the slider, like in the demo above. Your visitors will love it! This slider has another great use. Have you got a page dedicated to each testimony? Use the Read more button to connect the page with each testimony slide. Every online merchant needs to have customer testimonials on their website. Their words help to build trust, and it does matter how you present the testimonials. You don’t need fancy effects to have testimonials that convert. Nor should you want to waste the visitor’s time by forcing them to scroll for ages. It’s high time to get rid of the long, regular testimonials! Use a testimonial slider instead, which saves space on your site. It also shows your visitors you value their time and attention. Why not start building a testimonial slider now?